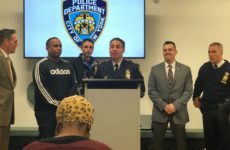 It was business as usual last Wednesday as Crime Prevention Officer Reina Marrero walked past the 40th Precinct’s holding cells. One was occupied. But on Halloween, these cells will be filled with a crop of unearthly inmates. “We’re gonna have cops in there as like zombie prisoners,” said Marrero, delighted. Over the 12 years she’s served the NYPD, Marrero has never had a task quite like this one, acting as one of two officers in charge of planning the precinct’s first haunted house. The 40th Precinct Community Council’s annual Halloween bash, Safe Streets and Treats, will take place at the precinct on Tuesday from 3 to 7 p.m. 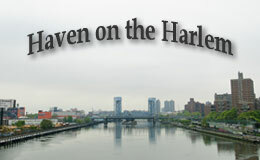 The party began on the heels of 9/11 as a way to unite the community, and has continued every year since. 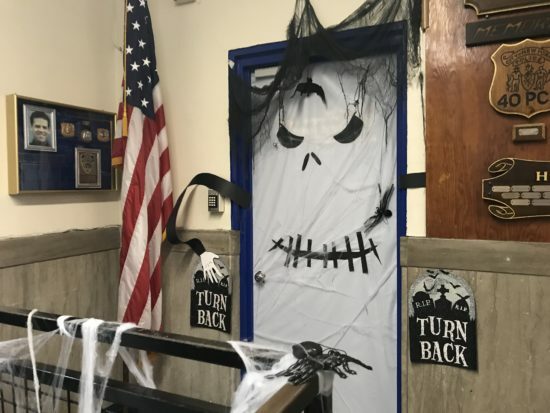 Though usually held on Brook Avenue, this year’s event will be a first at the actual precinct at 257 Alexander Ave., with a kid-friendly haunted house inside the station. Community Council President Gabriel De Jesus hopes this year’s celebration will help connect the precinct to the community, especially for those who hold grudges against law enforcement. From 4 to 6 p.m. on Tuesday, officers will lead groups of 10 through a circuit of scares in the precinct, with candy awaiting brave souls at the end. For those who prefer to stay outside, guests can also expect music, games and free goodie bags stuffed by NYPD Explorers. Anyone who would need to be processed at the 40th Precinct will do so at another precinct. The 42nd Precinct, based in Morrisania, will also host a haunted house on Tuesday. That means—according to Marrero—there’s a friendly competition between the two station houses. Marrero and Officer Elizabeth Michel had begun decorating the precinct over a week in advance, swathing cobwebs, hanging black sheets and crafting creative frights on a budget. At the haunted house’s entrance on East 138th Street and Alexander Avenue, the team is proud of a skeleton draped over a plastic mattress, oversized spiders at his gaping mouth. His bony wrist limps in a handcuff fastened to a metal bar. “Yeah, two thousand!” Marrero quipped back. Norwood mom Danielle Guggenheim, 49, was intrigued by the event as a possible Halloween option for her 4-year-old and 9-year-old. 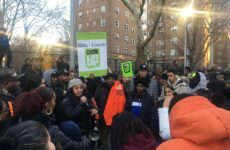 “I think the police should be part of the community outside of you going there when you have a problem,” said Guggenheim in support of the precinct’s plans. Rubén Austria’s toddler son might be too young to enjoy the precinct’s party anyway. But as the founder of Community Connections for Youth, a local nonprofit focused on alternatives to incarceration, he’s opting out for other reasons. There are plenty of Mott Haven children who might have a parent in incarceration, Austria pointed out.